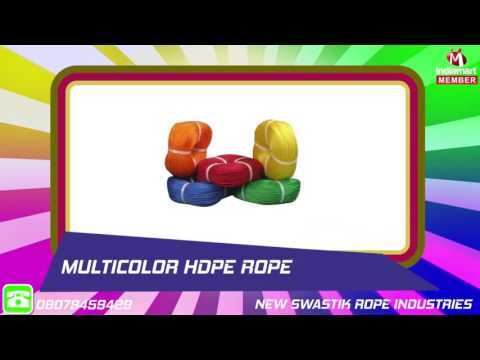 Founded in the year 2016, New Swastik Rope Industries is an eminent company indulged in the business of manufacturing, wholesaling and exporting an incomparable assortment of Ropes Products. Our range comprises of wide variety of HDPE Ropes, PP Ropes and Danline Ropes array we offer is highly in demand in the market for its matchless qualities and known amongst our patrons for its light weight, excellent strength, high flexibility, controlled elongation, greater abrasion resistance and heat resistance. Our offered products are used for industrial purposes, climbing, shipping, lifting and cleaning industries. Owing to our client-centric approach, we have been able to fulfil diverse requirement of our prestigious clients by manufacturing ropes as per the global quality standards. We have earned a reputed position across the market on the basis of our client-centric approach, quality products, prompt deliveries, pocket-friendly rates and flexible payment options. We strive to achieve a dominant hold over the industry within few years. Our mission is to achieve the top notch position in the rope market.